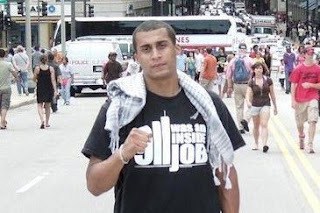 Jared McKinstry aka Dubble is Political Hip Hop artist from the Chicago-land area. Heavily involved in the 9-11 Truth Movement and other activism, Dubble strives to always deliver a message in his music. “Entertainment without Content is Distraction” is a motto often used by the 24 year old artist. Born the 2nd of 2 children to a Mix raced, lower class family then moving to a quarter million dollar home, Dubble has experienced living in both sides of the social spectrum. Conscious of his situation, he has always attempted to better understand and discuss the racial and social problems that are present today. Using his music to further his activist goals Dubble creates hard hitting, socially conscious music that fans of every genres can appreciate. Currently Dubble is working on several Projects including his new album The Awakening in which he elaborates on every topic from the New World Order to the Federal Reserve. Dubble is also in collaboration with New York rapper Truth Now on an EP entitled Prohibition, where the two artists discuss the politics of marijuana prohibition.